Have you ever questioned why the United States is the country with the most citizens in jail? Does the rise in mass incarceration come from the choices of individuals or the country they belong to? Although answers vary, I believe social prejudices influence citizens and how we perceive mass incarceration. I develop my argument with my book, Ugly Truth. The United States is the world's leader in incarceration with 2.2 million citizens residing in the nation's prisons and jails. The incarceration rate has increased by 500% over the past 30 years, and more than 60% of the people in prison are now racial or ethnic minorities. Inspired by documentary, "The House I Live In" by Eugene Jereki, I created a book that examines the role of prejudice in our law enforcement system and its influence on the social problems we face today. To do so, I first collected comments and opinions from various online forums and newspaper articles which reveal how many Americans are prejudiced toward racial and ethnic minorities. Then, I put the comments under the scripts of "The House I Live In" in order to draw the connections between prejudice, crime, and incarceration. 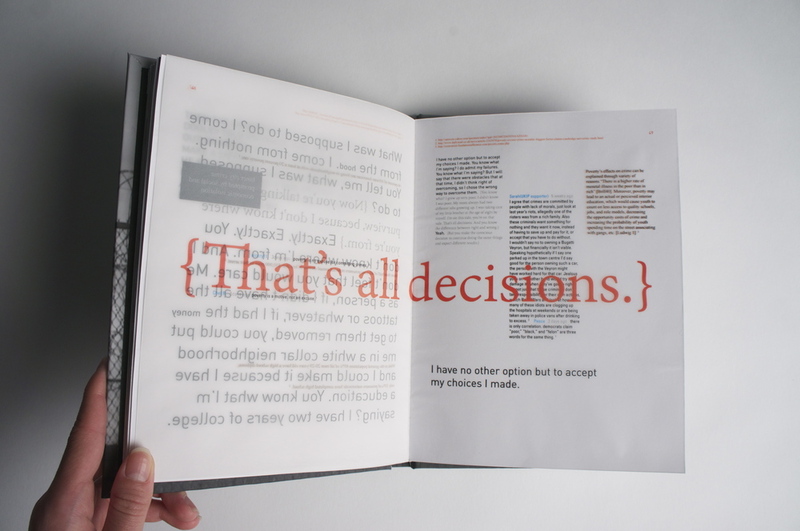 To communicate the idea that mass incarceration would not have occurred without prejudice, I used typographical treatment: I put statistics and psychological studies about racial prejudice in layers of orange & black text, and made the text layers become legible when a reader places the orange PVC film provided with the book over an open page. 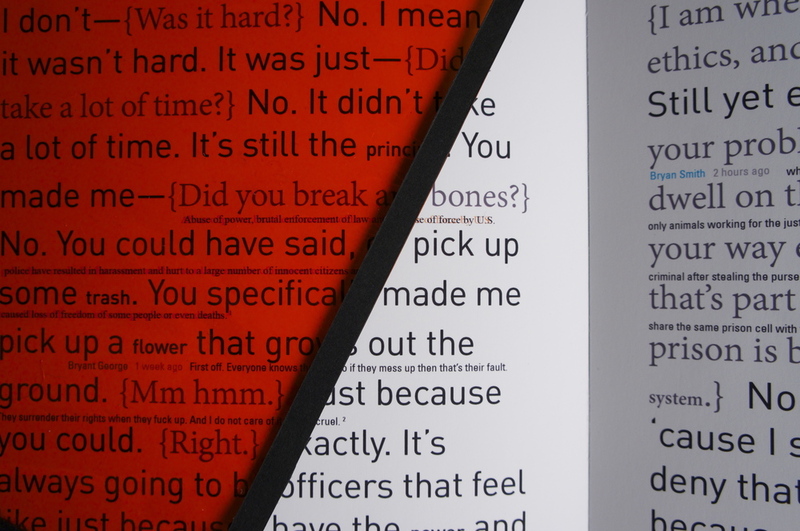 The orange PVC film signifies prejudice, emphasizing that the high incarceration rate has resulted from Americans' unwillingness to recognize the impact of their attitudes. 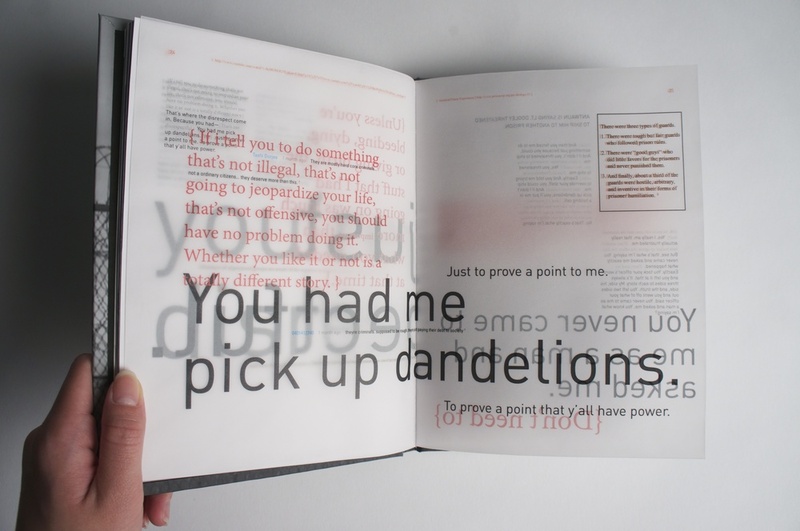 To communicate the complexity and opacity of the problem, I used several text layers with semi-transparent vellum paper. The book speaks Americans' refusal to see our fault in the social problems we face today, instead of blaming others for the outcomes of our own prejudice.